With offices throughout Latin America, EMS is able to provide direct support locally for our clients. At EMS we believe that your company’s talent should not be limited by borders, for this reason we offer end to end global immigration services to over 85 countries. EMS – Employee Mobility Solutions makes employee relocation hassle free and easy. Rely on our professionals to make workforce mobility an easy task. Our solutions cover all aspects of immigration in both the home and host cities and in all parts of the world, insuring the necessary documentation is handled promptly and all legal requirements are fully met. EMS Employee Mobility Solutions acts as a trusted friend and guide in the new location, offering personalized assistance to help the employee and their family adapt quickly to their new home. With more than 28 years of experience helping companies of every size, EMS has expertise in every step of the relocation process, providing solutions adapted to the needs of the company, the expatriate and their family. A talented team of experts offers prompt, effective and tailor-made solutions for the Human Resources department as well as the employee. Flexibility is a key ingredient of our success. Our services are adapted to the individual needs of each client and are constantly reviewed to make sure each step is optimized to the fullest. We have developed our own online Expat Management System (EMS), which gives our clients real time information in each step of the process. EMS has a quality management system that meets the requirements of the reference standard: UNE-EN ISO 9001; 2015. EMS implement a Quality Mangement System based in the norm UNE-EN ISO 9001; 2015. 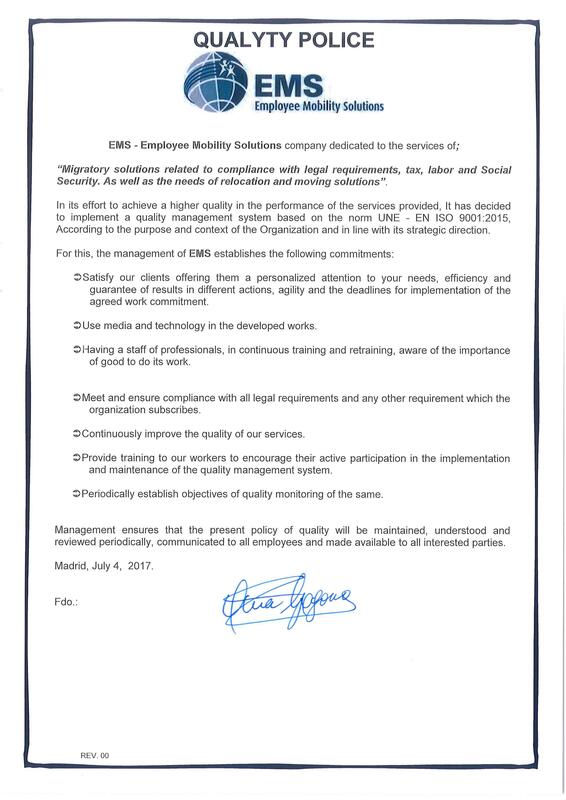 EMS is an International Provider of Immigration, Tax and Employee Relocation Services providing flexible solutions for organizations worldwide.